"Take a deep breath" is the mantra of every anxiety-reducing advice list ever written. And for good reason. There's increasing physiological evidence connecting breathing patterns with the brain regions that control mood and emotion. 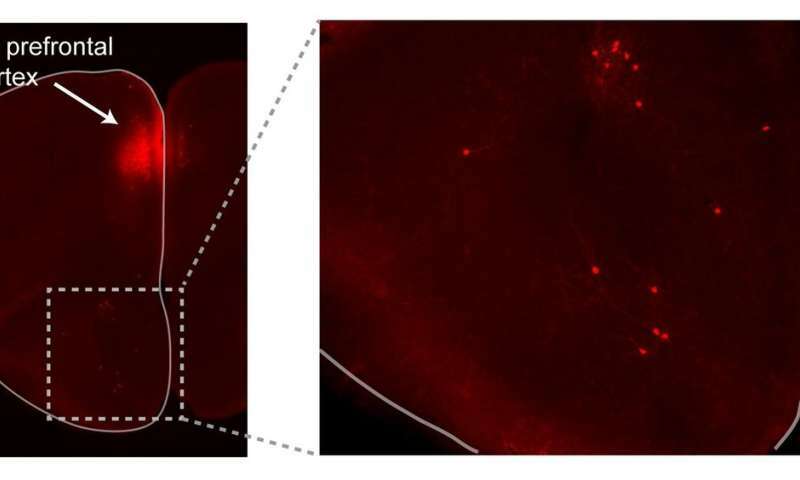 Now, Minghong Ma, PhD, a professor of Neuroscience in the Perelman School of Medicine at the University of Pennsylvania, and Penn doctoral student Andrew Moberly, have added neurons associated with the olfactory system to the connection between behavior and breathing. These findings are published this week in Nature Communications. Connecting patterns in these interactions may help explain why practices such as meditation and yoga that rely on rhythmic breathing can help people overcome anxiety-based illnesses. "We wanted to know why and how fear behavior, controlled breathing, and smell centers of the brain were connected," Ma said. "What really drives our interest is finding out what we can extrapolate about this relationship to learn about the evolution of behavior and apply this knowledge to help ease the pain associated with such disorders as post-traumatic stress disorder." In earlier studies, Ma found that ends of neurons in the nose have odor sensors as well as the ability to detect the rate of breathing. "The nose really does double duty in its function," Moberly said. "Why and what role does this have in behavior and what does that fear behavior look like in rodents? Their behavioral choices for survival are fight, flight, or freeze." To tease apart these overlapping characteristics, Moberly first trained mice by pairing a specific sound with a light foot shock to induce "freezing" in the normally mobile mice. Freezing behavior is a quiescent period that is unusual for scurrying mice. When he plays the sound associated with the foot shock, "trained" mice literally freeze in their tracks. Knowing that humans have the ability to voluntarily control the breathing patterns, "now the field is asking, how do we breathe differently in different emotional situations," Ma said. "Evolutionarily this makes sense. If a mouse in the wild senses danger by smell, for example, it may freeze and slow down breathing as a survival instinct. Now we want to know how we can apply that knowledge to humans. It would be interesting to find out what breathing patterns are most effective in influencing human brain activity and emotional states"